Virtual Iron provides enterprise-class software for server virtualization & virtual infrastructure management. The product offers comparable capabilities and performance to established proprietary offerings – for just a fraction of the cost. By taking full advantage of industry standards and open source economics, Virtual Iron dramatically reduces the cost and complexity of virtualization and for the first time, makes production-ready capabilities available to the mainstream market. Virtualize enterprise-class workloads running on unmodified Windows and Linux operating systems. Improve the utilization of current systems and reduce power, space and cooling issues through server consolidation. Quickly set up development, test and production environments. Recover from failures quickly, reliably and cost-efficiently. Match resource capacity to workload demands automatically. Reduce human labor and errors via policy-based automation. 1. 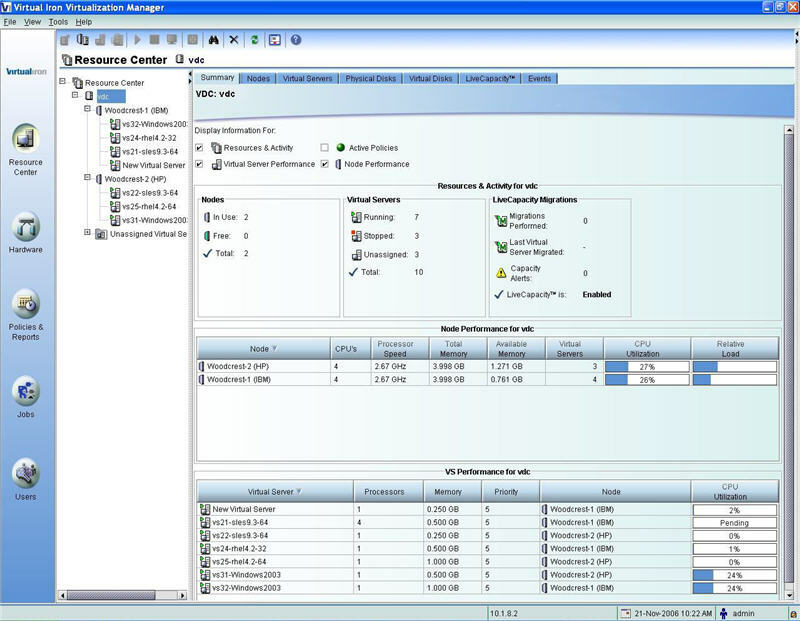 Virtual Iron's Virtualization Manager provides a central place to control and automate virtual resources. It streamlines tasks that are normally highly manual and time-intensive and significantly reduce data center costs and complexity. 2. Virtual Iron's Virtualization Services are deployed automatically on bare-metal, industry-standard servers without requiring software installation or management. These features streamline data center management and reduce operational costs. 3. Open Source Virtualization, based on an open source hypervisor derived from the open source community project, is the first software loaded when the physical server boots. The hypervisor manages all hardware resources and leverages the hardware-assisted virtualization capabilities built into Intel and AMD processors to create an abstraction layer between physical hardware and virtual resources. Virtual Iron is sold exclusively through a select group of authorized Virtual Iron Channel One Partners. You may also download free versions of the product here for evaluation.